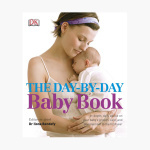 DK The Day-by-Day Baby Book | Multicolour | This book guides you by essential day-by-day advice for your baby's exciting first year . Every new mom has to know what to expect in the first year after having a baby. This handbook provides you with an in-depth advice on your baby’s development, growth, and care in the first year. Feature 1 : This book guides you by essential day-by-day advice for your baby's exciting first year .